CPBO spent October 15 – 18 providing free pro bono opportunities and educational resources to the hundreds of attendees of the 2017 Association of Corporate Counsel (ACC) Annual Meeting. CPBO is a global joint partnership between PBI and ACC and provides consulting services and other resources as a member benefit for ACC members. CPBO kicked off the meeting with a Clinic in a Box® Program – Select Topic on Monday morning. The clinic was co-hosted with ACC National Capital Region, D.C. Bar Pro Bono Center, and Womble Carlyle*†. The clinic trained 31 volunteers on social media policies and online marketing compliance before they met with their local nonprofit clients. To learn more about the clinic, check out our blog post: CPBO’s Clinic in a Box® Program Tackles Social Media Policies for Nonprofits. On Tuesday, over 80 people attended CPBO’s session: “Ethics of In-house Pro Bono” which offered an overview of the ethical issues in-house attorneys face when representing clients in pro bono matters in the US and globally and addressed practical issues related to in-house pro bono. Expert panelists Andrea Bridgeman, Associate General Counsel at Freddie Mac**; Jon Downs, Head of Legal – Australia at Willis Towers Watson**; and Katherine Giddings, Partner at Akerman† led the discussion and answered questions. Attendees learned about a range of topics, including: administering a pro bono program, managing conflicts (both legal and business), and securing malpractice insurance. Miss the session? You’re in luck! It is available on-demand here. Also, check out the resources referenced in the session: In-House Global Pro Bono, In-House Pro Bono Insurance, and Right to Practice In-House Pro Bono. 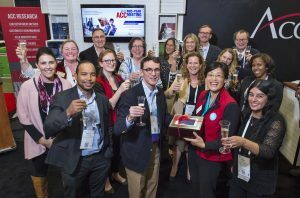 On Tuesday evening, CPBO and pro bono leaders gathered at the ACC Booth for a champagne toast to honor the winner of this year’s Chapter Challenge: the ACC Arizona Chapter. 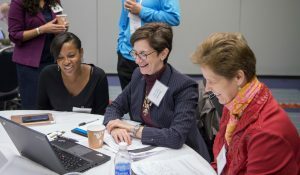 The Chapter Challenge is a fun competition among ACC chapters to see which chapter can inspire the most companies to become new signatories to the Corporate Pro Bono Challenge® initiative. Well done, ACC Arizona Chapter! In addition to bringing on new signatories, ACC Arizona Chapter has been creating a statewide structure to facilitate pro bono activities for in-house counsel by addressing impediments to pro bono participation and providing organized, engaging opportunities for pro bono service. Learn how they’re doing it: Spotlight: Arizona ACC Chapter Transforms State’s In-House Pro Bono Activities. 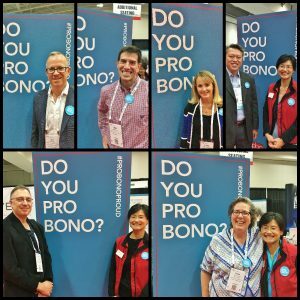 Throughout the Annual Meeting, CPBO staff spoke with more than 90 pro bono leaders as well as attendees interested in pro bono at the CPBO booth in the exhibit hall. CPBO even added more signatories to the Challenge. A few chief legal officers visited the booth to sign the Corporate Pro Bono Challenge® statement, declaring their department’s commitment to pro bono service. At the meeting, CPBO welcomed Bright MLS, Inc.**, Calvary Robotics**, and NHL, Inc.** to the Challenge, bringing the total number of Challenge signatories to 177. Inspired to launch your department’s pro bono program but don’t know how to start? 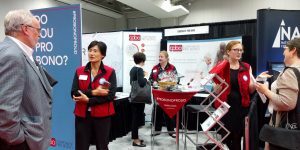 CPBO is here for you as an ACC member benefit! Learn everything you need to know and get advice from seasoned in-house leaders with CPBO’s “Getting Started Series” launching in March 2018. Learn more here or contact Tammy Sun at 202.729.6980 or cpbo@probonoinst.org.